Stepping stones are one of our favorite solutions. They come in various sizes, quality and materials. Whether you choose to do it yourself or hire a landscaping company, installing stepping stones in your landscaping is easy if you take the right steps. Have the right quantity and use the right spacing. Your guests are most likely not playing hopscotch. Walk several times through the area with normal strides. Make sure the stepping stones in your landscaping are easily tread by people of all sizes, otherwise they’ll be more trouble than they’re worth. Account for a comfortable pace. I prefer no more than 12” between the stones. However, the size of the stepping stone does affect the final placement. Remember who will be using the path as women and children usually have smaller paces then men. Choose the style of stepping stones that matches your style. There are precast and natural stones of all shapes, sizes, colors, and textures. Pick a style that will complement your existing hardscape and structure. Sometimes a straight line will work, other times a curved path is best. Your landscape designer can help with ideas, layout and/or installation of stepping stones in your landscaping. Make sure you have a level surface for the stepping stones to set on. Consider adding loose topsoil or even a thin layer of sand under them to help with leveling and to minimize rocking. Don’t try to set stepping stones on gravel or stone dust, as this will not create a smooth, level base. You may need to cut away soil, mulch, etc. beneath the stone so it sits flush. You don’t want to create a tripping hazard. Pull mulch away, set the stones, and then move it back with your hands, tamping it so it is level with the top of the stepping stone. Stepping stones aren’t just for refreshing a tired path. They can also add a fun texture to the landscape or direct people where you want them to walk vs. the cut-through they may choose. 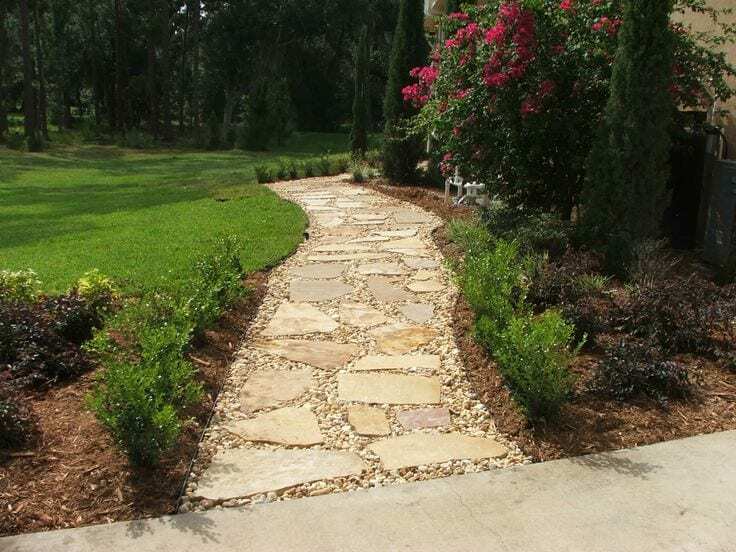 Adding stepping stones in your landscaping can help keep your shoes and feet clean and dry as you step through your flower bed to the water spigot or other accessible items. If you’d like to talk more about how our landscaping team can help create a path using stepping stones, please don’t hesitate to contact us.